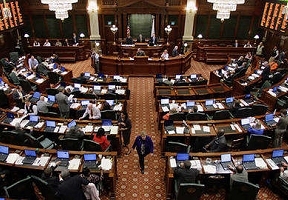 State Representative Camille Y. Lilly, D-Chicago, is fighting to give parents control of their local schools by passing legislation that changes Chicago’s appointed school board into an elected, representative school board that answers to local families and taxpayers instead of insiders. “The families I represent on Chicago’s west side aren’t being heard by Chicago’s appointed school board even appointed insiders close schools in communities of color, raise taxes, and pile on more debt,” Lilly said. “My bill gives my families the power to choose who is best for their local schools, and take back control of our children’s education.” A long-time advocated for accountability and transparency on Chicago Public School’s (CPS) board of education, Lilly voted to pass House Bill 2267, which creates a new 21-member elected school board replacing the current appointed board. Board members would be elected to four-year terms serving districts of equal population beginning in 2023. Chicago is the only school district in Illinois that does not elect its school board. Lilly’s bill garnered near unanimous bipartisan support and advances to the Illinois Senate.